Can the UK help the steel industry under EU rules? 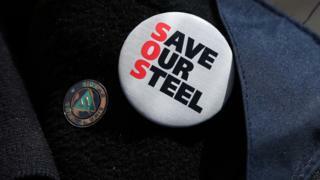 The UK government has said it will consider helping Port Talbot steelworks - but any intervention risks falling foul of European Union state aid rules. The EU does not allow state support of a business if it would distort competition in the single market. The final decision on whether state aid is allowed is down to the European Commission. It applies rules agreed by every country in the EU. But the steel industry is a special case. Because the European Union already produces more steel than it needs, the member states of the EU agreed to allow uneconomical producers to go bust, rather than let governments save them. So that is the first question for Port Talbot and the other parts of Tata Steel UK - can they survive on their own? If they can't then the government's hands are tied. There are some ways round the rules. The first is national security. Under the 1957 Treaty of Rome, one of the founding treaties of the EU, countries can "take any measures necessary" if an industry is essential to national security. This is supposed to refer to arms, munitions and "war material". Does it apply to hot rolled steel? Legal experts think it's unlikely, although Lord West, the former First Sea Lord and Chief of the Naval Staff has told the BBC that UK production is vital for the defence sector. The second is a move to avoid "a serious disturbance to the economy". This was one of the arguments used to justify the bank bailouts. It might also be used to justify aid to the Greek banking system. But the loss of 15,000 UK jobs - or even 40,000 UK and European jobs - may simply not be considered a serious enough disturbance by the European Commission to justify a government handout. The last option isn't state aid at all. A government can own a company under state aid rules but it is not allowed to keep it going if it would otherwise fail. This is the closest the government can come to "nationalisation". If the government can convince the European Commission that buying a business is a sensible move that any investor would make for a profit then it is not classified as state aid. However with Port Talbot reportedly losing £1 million a day this may be a tough sell. So why did we bail out the banks? State aid is not banned in the European Union, but it is tightly controlled, and in 2008 the banks met the necessary criteria for a bailout. As well as being vital for the stability of the economy, it was generally accepted that the UK banking sector had a profitable future. The aim of the EU state aid rules is to ensure any government intervention produces a sustainable independent industry. As far as the rules are concerned, it is hard to make that argument for the UK steel industry. However, in the coming weeks many people will be doing just that, and adding that it is the government's role to provide a bridge - of some sort - to a sustainable future for UK steel.